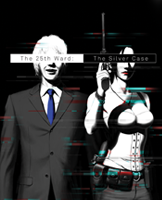 The 25th Ward: The Silver Case | NIS America, Inc. Available for the first time outside Japan, The 25th Ward: The Silver Case is presented with new HD assets and additional content not found in the original version. A SUDA51 Trip – Set in the “Kill the Past” universe, the series continues its bleak look into a semi-futuristic world on the edge of collapse and the misfits and antiheroes that inhabit it. Brave New World – The return of the signature “Film Window” system is brought to The 25th Ward for the first time! New visuals, sounds and controls capture the game in a fresh perspective. One Story, Many Sides – Includes all three of the original arcs released for the title, “Correctness”, “Placebo”, and “Matchmaker”. ACTIVE GAMING MEDIA / GRASSHOPPER MANUFACTURE INC.
© GRASSHOPPER MANUFACTURE INC. All Rights Reserved. Licensed to ACTIVE GAMING MEDIA Inc., Sub-Licensed to and published by NIS America, Inc.